Participants at the Morning Worship and Theological Reflection Session led by Dr. Susan Thomas. 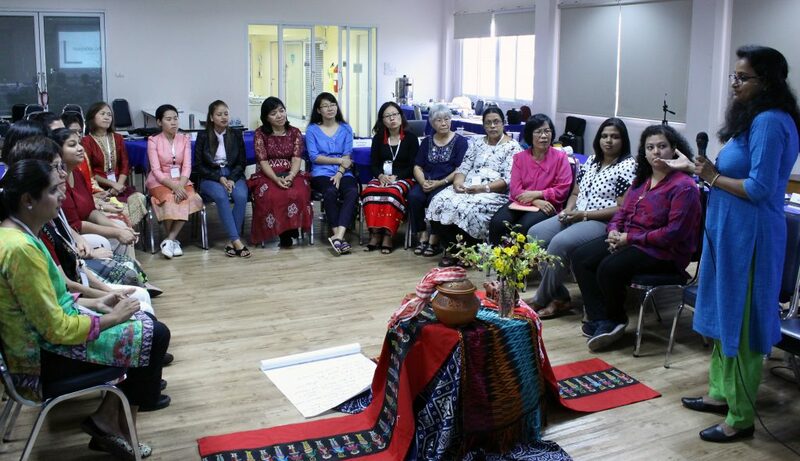 A three-day Consultation organized by the Christian Conference of Asia (CCA) focused on the theme ‘Transforming the World and Building Peace’ called to empower women in church and society to combat gender-based violence. “Women as victims of violence and as survivors have long mobilized themselves to resist violence, and they have proved effective in peace advocacy, social conciliation, and negotiation. Women are valuable partners of God’s incredible plan of gender diversity; they are created with a purpose and for a purpose. They should not be discriminated on the basis of gender identity”, observed the participants during the discussion. The Consultation was held at the YWCA in Bangkok from 15 to 17 November 2018 and attended by 28 representatives of women’s divisions of CCA member churches and national ecumenical councils across Asia. The participants representing church related women’s organizations shared struggles of grassroots women in combating violence. They emphasized the need for urgent actions for providing the tools and space for dialogue and deeper understanding about the increasing trend of gender-based violence. Deekshya from Sri Lanka narrated the examples of how courageous women at the grassroots in her country who as victims of violence and as survivors have long mobilized themselves to resist violence by peace advocacy, social conciliation, and negotiation during the civil war period in northern Sri Lanka. Quoting the statistics of a recent UNICEF survey which estimated 35% of Cambodia’s 15,000 prostitutes are children under the age of 16”, Srey Sotheavy, a Cambodian young Christian woman peace activist said, “in order to counter this situation in Cambodian society, the Church in Cambodia need to seek the support of civil society and other faith-based organizations to work together and combat trafficking of women and children”. Biblical theological reflections on women in Biblical narratives such as Ruth, Hagar, Deborah, and Vashti focused on how to engage and encourage Asian Christian women to re-read the Bible from women’s perspectives. “We need to find ways to re-write the stories of our own faith and witness in contemporary contexts, and we should not allow bitterness and disappointment to influence our lives”, opined the participants. Dr. Susan Thomas, a lay representative of the Jacobite Syrian Orthodox Church in a presentation narrated the stories of the Biblical characters of Deborah and Vashti, and their examples of assertiveness and courage. “Deborah, who was an assertive woman leader exemplified the qualities of a prophetess, just judge and strong administrator, and she was as equal to any other prophet in the Bible. Women in the Biblical narratives who resisted violence and oppression also had to face difficult situations as they stand against injustices. Together we can build peace, bring the change, and transform the world; hence we need coordinated actions to combat violence and oppression”, said Dr Susan Thomas. The participants urged the churches and ecumenical councils to encourage women and men to work together in a common platform to achieve the goal of gender equality and elimination of violence against women. The Consultation was the third in a series of annual regional consultations organized by CCA as part of a new programme initiative – Ecumenical Women’s Action against Violence (EWAAV). An Asian Ecumenical Women’s Assembly (AEWA) to be held in Taipei in 2019 will be a major ecumenical event of CCA with focus on ecumenical action of Asian women to combating violence and building peace.